Building a biological biocide - NO FAKE! Keeping the body safe from bacteria without using harmful toxic chemicals is a delicate balancing act, but Aqualution Systems has a solution. Established in 2002 by a team of scientists in the pharmaceutical industry, the Scotland-based company manufactures packaged hypochlorous acid (HOCl), a highly effective biocide that can be up to 300 times more effective at killing microorganisms than bleach. Inspired by the human body’s natural defences, its products are made of the same acid produced by the body to fight viruses and bacteria, making them completely safe for people and animals. When bacteria enter the body, neutrophils – a type of white blood cell – are released from the bloodstream and, via a chemotaxis process, migrate to the bacteria. The neutrophils surround the bacteria and release an enzyme, NADPH oxidase, which is usually dormant in the body, but is activated when the body is under threat. This decays to produce hydrogen peroxide, which reacts with sodium chloride to produce HOCl and sodium hydroxide. The HOCl then kills invasive organisms through the myeloperoxidase-mediated peroxidation of chloride ions. Aqualution Systems’ technology mimics the human immune system to kill viruses, bacteria and other microorganisms. This includes Escherichia coli, Norovirus, methicillin-resistant Staphylococcus aureus (MRSA), influenza and Clostridium difficile that are problems in hospitals, food processing and animal welfare. 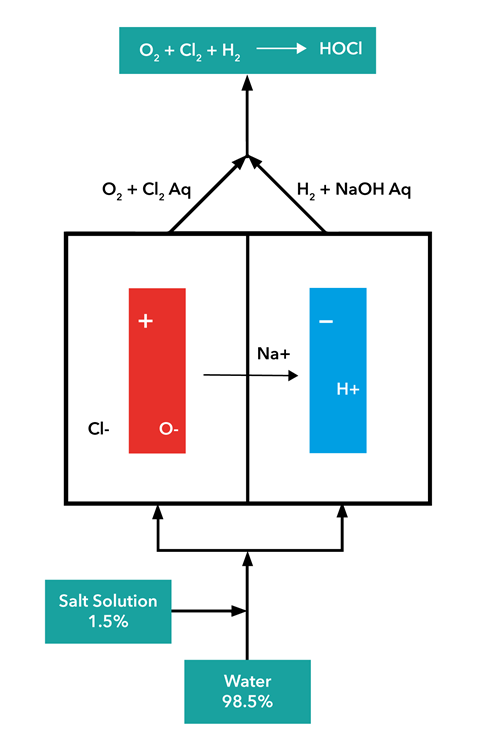 By using a combination of electrolysis and ion exchange technology, softened water and food-grade salt, the company has managed to replicate the process in the lab. The process converts common salt into HOCl without any toxic impurities, using 80% fewer chemicals, 80% less water and 85% less energy compared to the current industry standard. But ‘it is a very unstable molecule and has to be generated on demand both in the human body and when generated through chemistry,’ explains Meakin. While other companies are active in producing HOCl, Aqualution Systems stands out because its products are genuinely stabilised and produced using electrochemical activation (ECA) technology. The design of its electrochemical cell means its generator units do not need prolonged maintenance downtime. And the company can generate a high purity HOCl solution over a wide pH range, because the technology disrupts the conventional chlorine chemistry equilibrium, where the chlorine species present is dependent on the pH of the solution and is a mixture of chlorine, HOCl and sodium hypochlorite. Our interpretation of managed decay is putting a very strong solution into a bottle knowing that it is going to breakdown and trying to control the rate of decay so that at the use by date there is still enough of the hypochlorous acid active present for it to be effective. With hypochlorous acid this gives two potential problems. Firstly the breakdown products in this model tend to be carcinogenic (because we are stable we do not form them) and secondly those breakdown products can generate some very unpleasant disinfection by products. Again we do not generate these because we only have the hypochlorous acid in our solution because it is stable. Its applications are limited only by the imagination. The livestock agriculture industry (chicken farming), food processing (minimally processed and ready-to-eat salads, vegetables and fruit), drinks manufacturers, infection control in healthcare, and human and pet first aid companies are eying up the product. It has the potential to improve herd health and reduce the requirements for antibiotics in dairy farming. 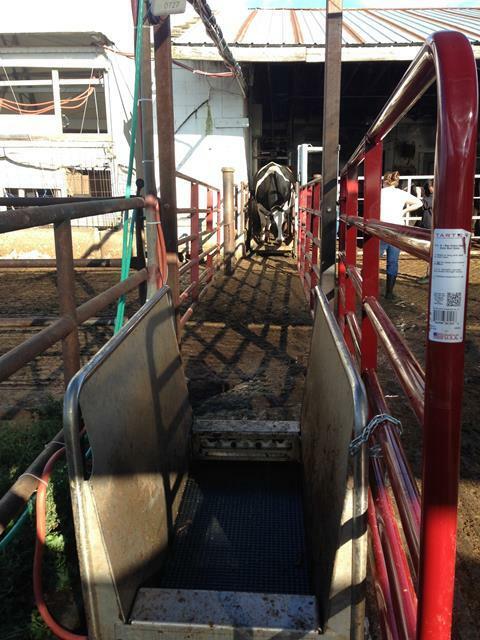 This would come from treating drinking water, feet hygiene, teat hygiene and milking equipment hygiene. ‘In the event of common health issues, the product can in many cases replace the use of antibiotics currently in use, with faster and better outcomes,’ Meakin says. 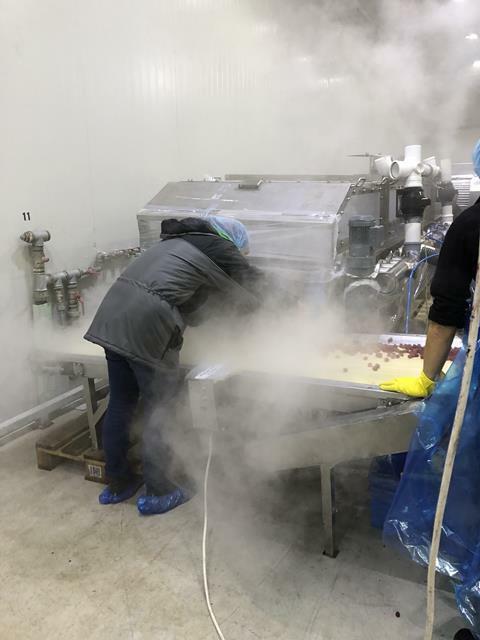 ‘We have developments close to market in the horticulture, crop protection, fruit processing and dairy farming industries, mainly working with Marks & Spencer, with whom we have a longstanding relationship, and its supply chain. We also work with pharmaceuticals,’ he adds. The company has installed units for M&S at its supply bases in Africa and these have led to savings of around 400,000 to 600,000 litres of water a week and financial savings of between £200,000 and £300,000. Looking further afield, it is examining the pure chemistry of the molecule and its potential application in the oil and gas sector. 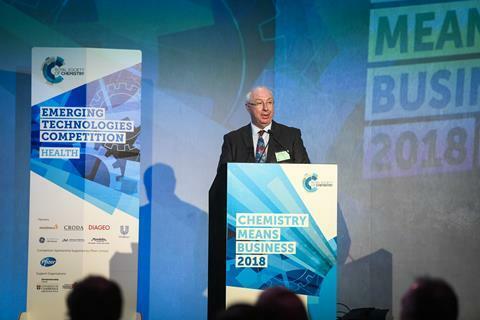 Last year, the company was a runner-up for a Royal Society of Chemistry Emerging Technologies award for the food and drink category and came third in the pharma category. ‘Winning the award gave us the credibility to engage with an international veterinary pharmaceutical company, which is interested in working with us to gain the necessary veterinary medicine licences and then to market the products globally,’ Meakin says. It also won the 2018 Scottish Government-backed VIBES Hydro Nation award. ‘We are actively seeking investment for both the pharma and non-pharma applications and, if successful in attracting the funding to speed up the projects we are currently working on, on the pharma side alone we could turn over £30 million in three years,’ Meakin says. It has 10 approved active substance dossiers under the EU’s biocidal products regulation and is working on four under the Medical Device Directive. It is also currently in the process of submitting four technical files to get marketing authorisations for dental applications, wound management and eye care.